Though Nashville is safely tucked away in central Tennessee—hundreds of miles away from any coastal waters—we often still experience the remnants of some big hurricanes. We recently, for example, felt some of Irma’s force, and fortunately, hurricanes Maria and Jose are not expected to impact Tennesse. However, hurricane season doesn’t technically end until November 30, and at the rate at which we are going—2017 is on track to break the record for the most named storms in history—it’s good to understand how your commercial roof can be affected by wind and strong storms. 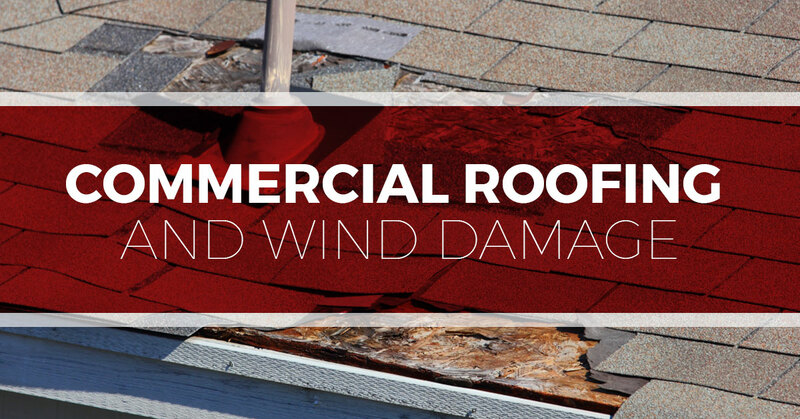 In this blog, we are going to look at how commercial roofs are most affected by wind and how you can spot any damage. If you need help replacing or repairing your commercial roof, don’t hesitate to contact Nashville’s Top Rated® Local Roofers. We offer flat roof repair, roof replacements, and can perform routine commercial roof maintenance. Read on to learn more about commercial roofing and wind damage. Many commercial buildings are protected by flat roofs, which are typically chosen because they can easily accommodate HVAC systems. Though we call them flat roofs, they are, in fact, slightly pitched so that water will run off and not create pools that can rot out your roof deck. Flat commercial roofs often have some combination of the following roofing materials: ethylene propylene, diene monomer (EPDM), modified bitumen, single ply, and/or metal. When a strong wind comes rushing through, it can get underneath the roof materials and pull them up. Naturally, when this happens, it can be detrimental to your roof’s integrity. To check if your roofing membrane is no longer securely attached, inspect your roof for wrinkles or bubbles that have formed underneath the surface. If you spot these signs, it is important to take action. If your roofing membrane is pulled up from the surface, rain and moisture can get in and begin to rot out your roof deck. Additionally, if the fascia is not completely fastened down and a strong gust comes along, it can tear off the flashing. This is why it is important to regularly inspect and replace all the components of your roof. Properly fastened and maintained metal edge flashing and fascia can significantly help prevent wind uplifting from occurring. If you’re in need of a trusted, local roofing contractor to come and inspect and/or maintain your commercial roof, don’t hesitate to contact Tim Leeper Roofing! In addition to wind uplifting, another potential form of damage created by strong storms is wind scouring. This occurs when a strong gust of wind blows in and pulls off granules or removes the gravel sometimes found on built-up roofs. This can seriously jeopardize the integrity of your commercial roof, and it will likely accelerate the deterioration of it as well. Spotting wind scouring can be difficult. Though this might be hard to notice, a professional roofing contractor can quickly point this out and save you the cost and hassle of having to replace your entire roof. For most owners of a commercial building, roof damage caused by wind isn’t on the radar. If strong gusts of wind hit your area, most owners don’t think about their roof unless the power goes out or a tree falls on the building. However, the threat of potential damage caused by wind should be taken seriously. This is why it’s important to inspect your commercial roof regularly and get out in front of any potential problems before they become big, expensive problems. If you would like our trusted commercial roofing contractors to come and have a look at your roof, contact us today! Get your speedy fast quote here!